It's been 2 years since I've started exercising regularly and consistently. Prior to turning 50, I started hitting the gym 4 times per week, and varying my routines. I started jogging, doing yoga regularly, and dipping my foot into different group exercise classes to see what I liked. After a few months, I had accidentally happened upon a consistent workout routine, and I was hooked. Today, almost 2 year laters, I am regularly hitting the the gym, sometimes 6 times per week, and have let go of my fear that everyone else there is better, fitter, thinner, and stronger than I am. Building on the mistakes I've made in the past and how I hope to keep the momentum going in the future, I've put together this list of easy tips I use for establishing a love-love relationship with your workouts. It's time to stop thinking of exercise as a chore and as another binary task to cross off your list. Exercise doesn't have to be boring or rigorous. Make a goal to do something active each day (a short brisk walk, light weight training, a quick swim). Some days will be more taxing than others, but the point is that if you are doing what you like, you'll begin to look forward to exercising and stop seeing it as a chore. I'd be lying if I said I didn't have days where I am dragging my feet up until the moment I step foot on the Stairmaster, but for the most part, I look forward to my daily workouts. However, there are days when I am not feeling it. On those days, I give in to the way I'm feeling and skip the workout. If I am approaching exercise with any kind of negativity, it doesn't end well. When I am in a positive frame of mind when I work out, my workout is more productive and effective. Where's the fun in working out if you can't wear cute clothes? Forget the oversized t-shirts and baggy sweats. 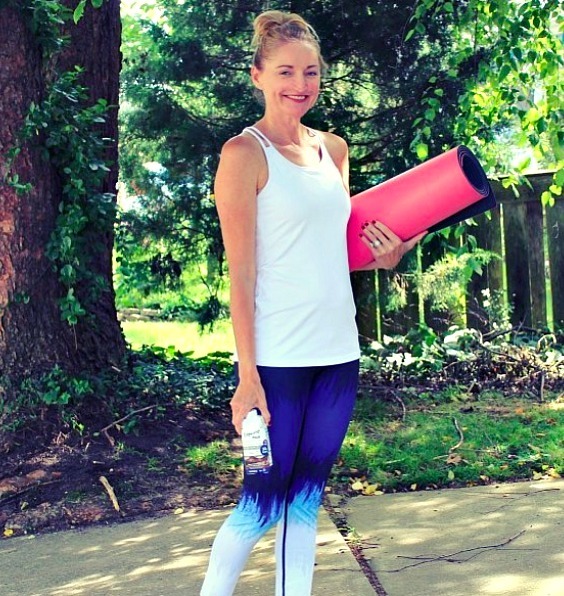 Invest in a few new pieces of active wear, and I promise, you'll be motivated to work out. Or buy a pair of new sneakers and challenge yourself with a set amount of steps or miles to break them in. 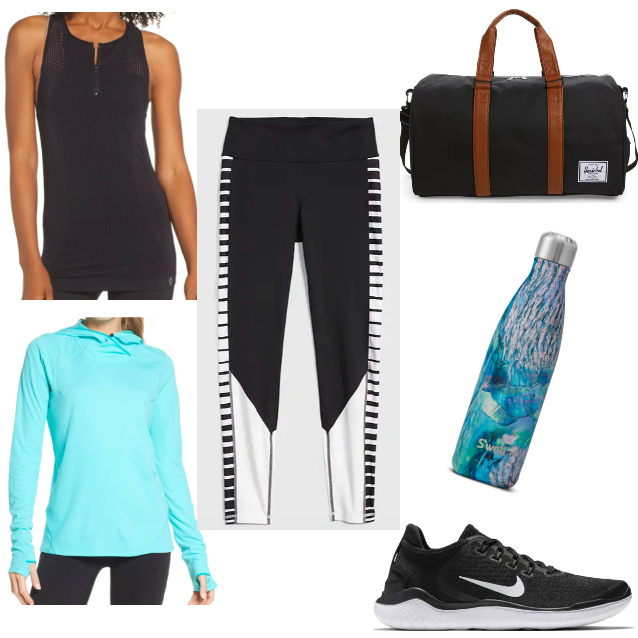 Here is an outfit that's ideal for working out. It includes clothes that are comfortable and cute. The perfect combo! Fitness trackers are great tools for helping you achieve your goals. Not only do they track your daily fitness, but many also offer groups which can provide inspiration and support when you need it most. I've owned various models of the Fitbit, starting with the Flex back in 2015. When the wristband on the Flex broke, Fitbit sent me the Alta at no charge. I just ordered the Fitbit Versa smartwatch this week. If it weren't for my fitness tracker, I would probably do less walking and running and more weight training and yoga. It keeps me motivated to do cardio and aerobic exercising. I use my Fitbit to keep me on target for daily steps and to engage in friendly competition in the form of challenges with friends. Many fitness trackers also provide free tips and training information as well as ways to monitor your sleep, diet, weight, and water intake. Another way to get stuck in a rut is to force yourself to love something you loathe. Forcing yourself to love an activity will only lead to dreading working out. Discover what you love and pursue that passion. For me, hot yoga, a good, strenuous walking workout mixed with intervals of jogging/running, and light strength training are my therapy. Check out my Pinterest board for workout routines and ideas.